There will be no racing at Queensland TAB meetings on Saturday to coincide the running of the 2018 Group 1 $5m Ladbrokes Cox Plate (2040m) at The Valley where super star mare Winx will be striving to make it four straight wins in the Weight For Age Championship. Winx, above, will be chasing her fourth straight win in the 2018 Cox Plate at The Valley. Photo by Steve Hart. Queensland Racing participants’ plans to strike on Saturday were confirmed overnight after the Queensland Government failed to supply an agreeable solution to the ongoing dispute in relation to the distribution of the newly implemented Point Of Consumption Tax on wagering. There will be no horses racing at Doomben, the Gold Coast, Toowoomba or Townsville on Saturday but the Brisbane Racing Club confirmed that there will be a phantom meeting at Doomben and the Club released the following statement via twitter. Winx will be chasing her twenty-ninth straight win and her twenty-second Group 1 victory and is marked at $1.22 at Ladbrokes.com.au to win her fourth straight Cox Plate and do something that has never been done before. The Chris Waller trained mare wrote her name into the history books last year when she equalled the long standing record of the legendary Kingston Town when she won her third straight Cox Plate beating the Darren Weir trained Humidor the and world’s number one rated race horse is in great shape to go one better this year. 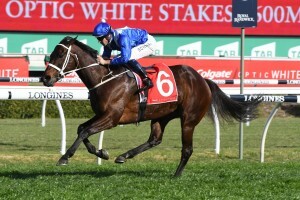 Winx completed her final serious workout for the Ladbrokes Cox Plate on Tuesday morning and trainer Chris Waller reported that horse and jockey Hugh Bowman were happy with the gallop. Bowman will again be aboard Winx who drew barrier six in the eight horse Cox Plate field while last year’s runner up Humidor will line up next to her in gate seven with Damian Lane in the saddle again. Humidor is on the third line of betting at $15 and sandwiched in between him and Winx is the Godolphin owned English raider Benbatl at $9. Benbatl is a widely travelled multiple Group 1 winner and showed his class with a hard fought win over another Godolphin runner, Blair House, in the Group 1 $1m Ladbrokes Stakes (2000m) at Caulfield on October 13. Benbatl has drawn barrier three and England based irish jockey Oisin Murphy will wear the Godolphin royal blue colours.